Irish youngster Sam Bennett (AnPost-Chain Reaction) took the biggest result of his career after a fine sprint into Caerphilly on stage five of the Tour of Britain, just three days after finishing a narrow second in Kendal. 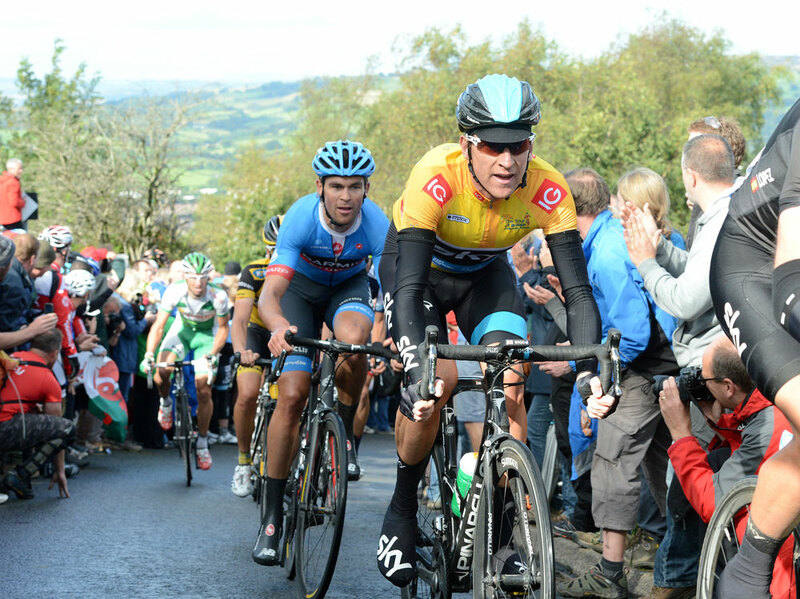 The 22 year-old had the legs over Michal Golas (Omega Pharma-Quickstep) after he fought hard to keep his place in the select group of around 15 riders that formed over the two ascents of Caerphilly Mountain. Dan Martin (Garmin-Sharp) and Nairo Quintana (Movistar) were the most aggressive over the short Welsh climb, where 2012 victor Jonathan Tiernan-Locke launched his race winning attack, but neither rider could open up enough of a gap on the way up to defend successfully on the way down. Race leader Bradley Wiggins meanwhile successfully kept hold of his gold jersey and time advantage after Sky teammates Ian Stannard and David Lopez put in the hard yards to chase down any threats to the former Tour winner’s position. 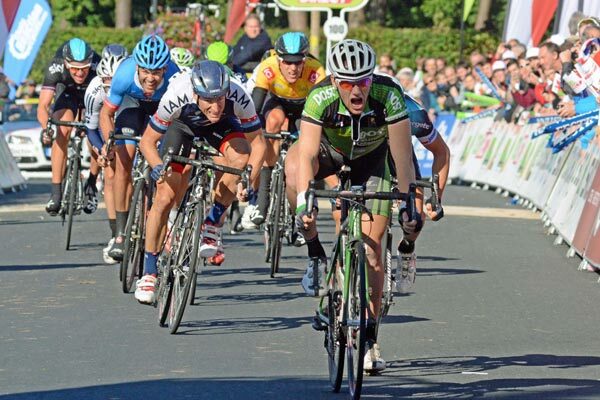 In doing so, Stannard also looked after his second overall, 37 seconds down on Wiggins. Before the stage Bradley Wiggins had identified the double ascent of Caerphilly Mountain as the most significant threat to his hopes of wearing the gold leader’s jersey into London, and from the gun set his Sky team out to keep the race under control. Under the sustained pressure of Stannard and Mat Hayman, the day’s break of Pete Williams (IG-Sigma Sport), Jacob Rathe (Garmin-Sharp), Stefano Pirazzi (Bardiani-Valvole) and Angel Madrazo (Movistar) were duly caught with 14km to go, Williams dropping back 20km earlier. Quintana was the first to try his luck on the first time up Caerphilly, breaking clear with Bardiani-Valvole rider Manuel Bongiorno and establishing an 18 second lead as the pair crested the first summit. However their advantage never looked like being enough on the fast, sweeping descent and Wiggins never looked like being put under too much pressure. A second attempt from Dan Martin on the final ascent, accompanied by Quintana and third place overall Martin Elmiger (IAM Cycling), proved equally fruitless. Nevertheless the fast climbing had significantly whittled down the lead group, with Bennett’s position and punch into the final bend with less than 200m to race enough to take the win. Simon Yates (Great Britain) snuck into the top ten on the stage to rocket up the GC and into eighth overall ahead of another key stage: tomorrow’s summit finish on Haytor. 10. Nairo Quintana (Movistar) all at s.t.